Most fleas infest a home via pets or mammal pests as they depend the blood from the mammal host to survive. Flea management for pets is important because many pets will acquire fleas outside which can lead to an infestation inside the home. Fleas can transmit diseases such as the rare bubonic plague and murine typhus. They can transfer tapeworms and cause anemia in pets. A female flea can lay 18 eggs a day, and they lay their eggs while the pet is sleeping so this area will have the highest concentration of fleas. 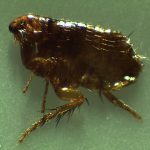 The main flea infestations are caused by pets, so if you have a pet that is frequently scratching themselves, or if you see blackish specks in your pet’s bedding there is a good chance fleas are present. Homes and buildings can be infested with fleas even when there are no pets around. This can happen from fleas being transmitted from other animals and attaching themselves to shoes, pants, blankets and any number of things that transfer the fleas to a new environment.